Henrissa Bassey joined BayLegal in 2016 as an Equal Justice Works Fellow sponsored by the Morrison & Foerster Foundation. Henrissa provides comprehensive legal advocacy to avoid the over-incarceration of justice-involved youth in Contra Costa County, with a focus on youth with disabilities who require additional, legally-mandated services and supports to successfully transition to community-based settings. Through her advocacy, she has helped her clients connect and re-connect to such vital entitlements as community-based mental health services, cash/food assistance, and extended foster care services. As part of her fellowship project, Henrissa also founded Y-LIFE, a youth-led advocacy collective that strives to integrate youth voice into the perspectives and policies of local decision makers and youth-serving providers. Y-LIFE’s mission is to amplify young voices affected by the child welfare and juvenile justice system through engagement with local decision-makers and youth-serving organizations. Project Description: Implement strategies for reducing youth incarceration in juvenile halls and camps. Project Description: Establish a bilingual medical-legal partnership in Contra Costa County to provide wraparound legal protections to Latina survivors of domestic violence, sexual assault, and human trafficking. Project Description: Provide on-site critical and comprehensive legal services to victims of domestic violence in Alameda County’s Highland Hospital through a medical-legal partnership. Brian Blalock joined BayLegal as a Skadden Fellow in 2007 with the goal of providing comprehensive civil legal services to children with disabilities in Alameda County. Over the course of his fellowship, Brian served as a core member of Alameda County’s Collaborative Court—a specialty court created in 2007 for youth whose connection to the delinquency system is directly related to their mental illness—and piloted an innovative partnership with Dreamcatcher Youth Shelter in Oakland. His fellowship evolved into the Youth Justice Project, now a team of 9 attorneys and 2 social workers that supports youth who are homeless or at extreme risk of homelessness, including youth in the foster care and delinquency systems, through full-scope civil legal assistance. The Youth Justice Project includes two dedicated attorneys who continue to staff the Collaborative Court and also represent justice-involved youth in an array of other legal matters, including education, healthcare access, extended foster care, and disability benefits. Youth Justice Project attorneys have replicated Brian’s Dreamcatcher pilot regionally, staffing additional homeless youth clinics in Contra Costa, San Francisco, and Santa Clara counties, and piloted an attorney-social worker model to provide even more comprehensive support to BayLegal’s most vulnerable youth clients. The Youth Justice Project has been highlighted as a model program by the ABA’s Homeless Youth Legal Network and is involved in numerous workgroups and coalitions promoting the rights of homeless and system-involved youth. Kemi Mustapha joined BayLegal in 2012 as an Equal Justice Works Fellow sponsored by the Norflet Progress Fund. She launched her project in San Francisco, which later expanded to Oakland, in order to address the unique barriers deterring African-American women from accessing BayLegal’s domestic violence prevention services in numbers commensurate with the high rates of domestic violence. During her fellowship, Kemi expanded BayLegal’s outreach to African-American communities by collaborating with several community and faith-based organizations and developing a system for direct referrals, including a monthly intake at The Bayview TLC Family Resource Center. Kemi also developed trainings and presentations for legal and social service providers on working with African-American domestic violence survivors and understanding the challenges that impede effective delivery of services to this population. A highlight of the project was the focus group of African-American domestic violence survivors that she conducted in order to assess community needs and develop appropriate responses. As a result of Kemi’s focused outreach, BayLegal saw an increase in the numbers of African-American clients accessing its domestic violence services. Kemi was able to provide culturally sensitive direct legal representation for her clients in family court, particularly in highly contested custody and visitation and restraining order cases, where she obtained court orders to enhance her clients’ and their children’s safety and stability. Kemi is currently a staff attorney in the San José office at Bay Area Legal Aid and continues to provide legal services to domestic violence survivors. The Project: Improve health access for indigent newcomer refugees in Alameda County through community outreach and education, systemic administrative advocacy, litigation, and direct client representation. 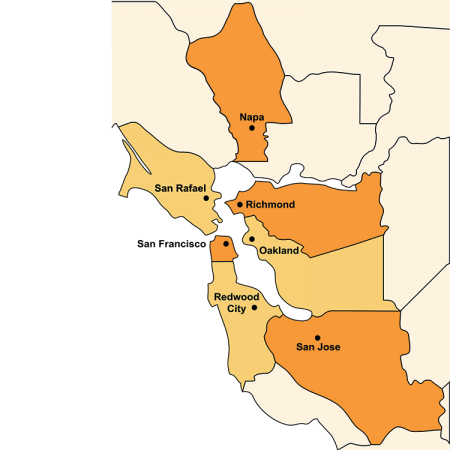 The overwhelming majority of refugees resettling in Alameda County arrive from extremely unstable country conditions where they were subjected to displacement and extensive trauma. As a result, they are plagued with disproportionately high rates of chronic and preventable conditions. Burmese and Bhutanese refugees, in particular, face poverty, staggering unemployment rates, and social and linguistic isolation upon arrival. Though initially all refugees receive eight months of medical assistance, virtually all single adults are disqualified thereafter. Under the terms of the Affordable Care Act, single adults will newly become eligible for healthcare coverage however substantial enrollment and retention challenges are expected. This project challenges health access barriers for newcomer refugees through outreach, advocacy, and litigation. Sheela Ramesh joined BayLegal as a Skadden Fellow in 2015 to launch a project providing comprehensive, direct civil legal services to and systemic advocacy on behalf of commercially sexually exploited youth and those most at risk of exploitation in the Bay Area. Sheela’s fellowship created a much-needed bridge between BayLegal’s youth justice and family law units. She forged relationships with community partners supporting commercial sexually exploited children (CSEC) across the Bay Area, held dozens of know-your-rights presentations to youth and providers, and trained BayLegal staff on the needs and legal rights of CSEC. Sheela built a deep expertise in domestic violence prevention, including restraining order and custody matters, and also represented clients in a host of other civil legal matters, including healthcare access, cash and food assistance, extended foster care, and domestic violence prevention. Although Sheela piloted her project in Alameda County, she later expanded her efforts to Contra Costa and San Francisco counties and was a critical partner on several multi-disciplinary teams dedicated to improving services for CSEC. Due in large part to Sheela’s work, the United States Department of Justice highlighted BayLegal as a model program for its success in providing comprehensive legal services to CSEC.